We are pleased to report that we have appointed a new Research Associate, Seth Mehl, to this project. The UK Government has recently stressed the importance of primary school children mastering spoken and written literacy skills. New specifications for the English curriculum at primary level were published by the Department for Education (DfE) in February 2013. These set out detailed programmes of study and learning objectives for each year of Key Stages 1 and 2 (KS 1 and 2). Grammar is accorded considerable importance at every stage, along with the formal skills of spelling and punctuation. Learning to understand the structure of the language is seen as integral to the development of reading and writing skills. Additionally, as part of a drive to improve standards, the government has introduced (in the current school year) a new statutory spelling, punctuation and grammar (SPAG) test for Year 6 at KS2. It will not be easy for many primary teachers to deliver the new programmes of study and the learning objectives, and to prepare their pupils for the new test, without having access to resources that will help them meet the requirements of the National Curriculum. In view of this we propose to extend the web-based platform Englicious that we built for teachers and students at Key Stages 3–5 at secondary school to new audiences, namely pupils at Key Stages 1–2 at primary school. Our extension of Englicious will result in a single coherent grammatical framework for Key Stages 1–5 from primary school to secondary school which teachers can use in the classroom and refer to with confidence. The creation of new resources for primary level will involve focusing on more fundamental concepts, and will also involve developing game-type activities. The UCL team will bring this about in collaboration with its partners, namely the National Association for the Teaching of English and St Aidan’s Primary School in the London Borough of Haringey. By working with these partners we can provide a new range of digital content specifically designed for primary schools in addition to the resources developed under the original Knowledge Transfer Fellowship project. The resources will be distributed on the Englicious site via the internet for use on interactive whiteboards, laptops, and tablets, with which primary school students are already familiar. To develop new English language teaching content specifically aimed at pupils at Key Stages 1 and 2 in three domains, namely spelling, punctuation and grammar. These new resources will need to be targeted at the right level in the curriculum. The aim is to develop engaging and enjoyable materials which pupils can work on in class using interactive whiteboards, and, where available, laptops and tablets. The National Curriculum for English reflects the importance of spoken language in pupils’ development – linguistic, cognitive and social – across the whole curriculum. Teachers should ensure the continual development of pupils’ confidence and competence in spoken language. To ensure that the resources tie into the newly proposed National Curriculum for English primary schools. To ensure pedagogical consistency across the primary and secondary curriculum. We propose to have a single coherent grammar framework within the school curriculum from primary school to secondary school. To develop Continuous Professional Development materials and documentation for the site which will support English language primary teachers in using the teaching resources, and which will be included as part of the website. Example exercise in whiteboard / slideshow mode (secondary school). This Follow-on funding application relates to an AHRC Knowledge Transfer Fellowship held by Professor Bas Aarts at UCL during which a prototype Web-based Platform for English Language Teaching and Learning was built for students and teachers in UK secondary schools (AH/H015787/1). This platform, which we call Englicious, was initially designed only for secondary school teachers and students in the UK. Its aim is to help teachers deliver the requirements of the National Curriculum in English, specifically skills such as spelling, punctuation and grammar. At the heart of the platform are UCL’s extensive English language databases (so-called corpora) which allowed the team to create a wide variety of innovative and interactive teaching materials. Authentic natural language examples, drawn from our databases, are used throughout, instead of artificial examples like The cat sat on the mat. Teachers agree that by being exposed to examples of real language, students are more likely to learn how to use grammar correctly in their own writing. Real examples are drawn dynamically from the corpus into teaching materials. This means that examples in the exercise materials and elsewhere change each time a particular kind of exercise is attempted by a pupil. This prevents pupils getting used to the same set of examples. The teaching materials include classroom lessons on English grammar, activities focusing on how written and spoken language differ, projects on the different uses of English in diverse settings, and tutorials on how to analyse texts from a range of genres. 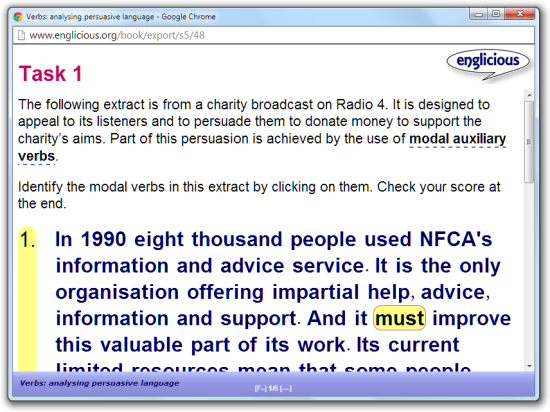 There are many interactive exercises which allow students to practise the material. Uniquely, these have been designed in such a way that they offer students feedback on their answers, telling them what they got right and where they made errors. The site also features a detailed and informative glossary, as well as suggestions for mini research projects, and there is advice for teachers on Continuous Professional Development in a dedicated zone on the site. Englicious is designed as a modular resource with an extensive suite of teaching materials that can operate as a full teaching programme, or as smaller, standalone activities through Key Stages 3–5 of the National Curriculum. 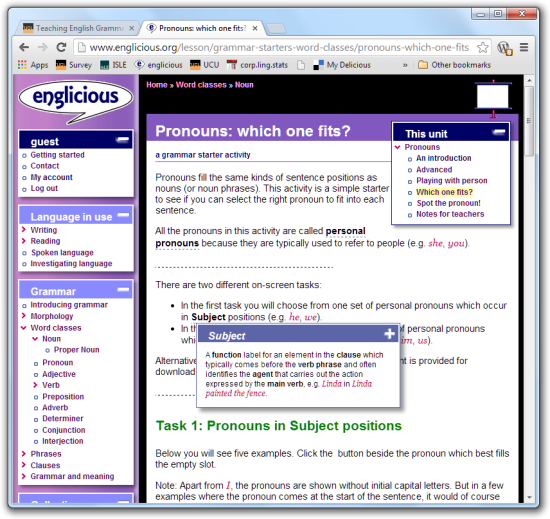 We now propose to extend Englicious to cater for primary English. The existing website provides a well-developed and suitable framework for such an extension. This will involve creating new materials which are designed for a younger audience in terms of conceptual level and appealing activity types, but which also provide for continuity into the secondary level. Our proposal to extend Englicious in this way is based on clearly defined current needs stemming from recent educational developments. At an earlier stage, in 2010, the DfE envisaged that English grammar would be a formally assessed component of the secondary school curriculum. However, in 2012 we saw a barely-announced policy shift. Plans for setting out a detailed, explicit grammar curriculum at secondary level have been shelved. Instead, there has been a stress on specifying the requirements for teaching grammar at primary level, in order to create a firm foundation which can be further built upon at secondary level. The new programmes of study for KS3 and KS4 state that teaching should enable students to consolidate, extend and apply the grammatical knowledge learned at primary school. The primary curriculum has thus gained in importance in government thinking. The document includes detailed programmes of study and learning objectives for each year. See the Appendix for an overview. Considerable attention is devoted to spelling, punctuation and grammar throughout the government documents. An understanding of grammatical structure is stressed as important in the development of reading and writing skills: for example, learning about the structure of words helps to develop vocabulary and to grasp general spelling principles. The document also contains a detailed glossary of grammatical terminology used in the programmes of study. Two members of the UCL team (Aarts and Bowie) are working with a government-appointed National Curriculum Committee that will decide on the final wording for the terminology covered in this document, and are hence closely involved with the National Curriculum. Although teachers need to prepare their pupils for this test, they have not been offered any support to help them do this. The extended Englicious site will assist them with this. Given the demands of the new curriculum and the test, we believe that the present project is timely in addressing the needs of pupils and teachers in the primary sector. Previewing a starter activity on the website (secondary school). Note the pop-up glossary and navigation elements. The extended Englicious website will greatly enhance the impact of the original Fellowship project beyond secondary schools into primary schools. As such the project is an activity “that build[s] upon knowledge exchange and pathways to impact already undertaken but which take[s] those activities in a new direction and to new audiences” (AHRC wording). There are currently just over 4 million pupils in UK maintained primary schools (source: DfE). These numbers are expected to rise by around 20% by 2020 (source: The Guardian). The project will thus deliver huge educational benefits to a large community of school children in whose lives Englicious will make a difference. Our proposed project addresses clearly defined needs in the primary education sector, at a time when schools are expected to meet the requirements of a new curriculum, to prepare students for a new Year 6 test, and generally to perform to a higher standard. Our extended Englicious site will support teachers by providing resources specifically designed to meet these requirements, within a sound grammatical framework which enables continuity into secondary schools. We believe that the project represents excellent value for money since we will create resources with the potential to reach millions of primary school children for a low cost. It is very important to stress that the aim of this project is to make a long-lasting impact on UK schools in the domain of English language teaching. In the future we hope to find commercial partners who can help us bring the Englicious platform to market and to make it available internationally. We envisage offering the platform to schools for free, or for a small admin charge.